I was cleaning my shelf this afternoon when I got of this booklet all stuffed with colorful, witty quotable quotes about women and men. I'd like to believe women are crazy, yeah, we're quiet known for that, but the main reason why women are crazy, is because men are stupid. Yeah, it's because most men just love women, but never have that idea of understanding them. Lol. I have to agree! Women tend to do crazy unexplainable things, not to mention those mood swings and sudden change of mind/ decisions. exactly!! 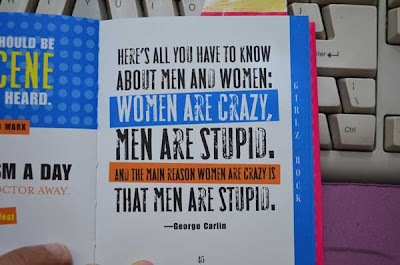 women are getting crazy because of stupid men!!! ahahaha!